We make visiting the Vatican easy: your personal story-teller will meet you at your hotel and organize the transfer to the site for you, so you can reach the Vatican Museums stress-free! The now highly-popular Early Morning Vatican access allows you to enter the museums one hour before the general public, and we at Eyes of Rome have given our very own personal touch to join the mix! With us, you won't have to wait in any static lines! Once you'll arrive, it will be the ideal time to join the moving security check line to enter the museums! 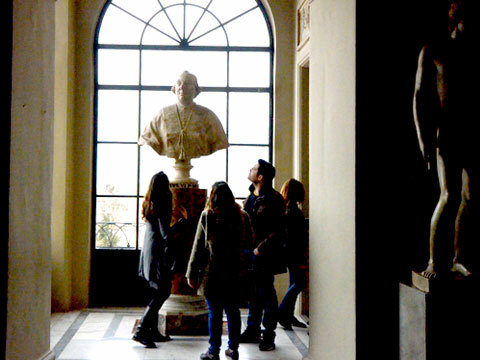 Enjoy an interactive experience with your passionate tour guide who will animate the history of the magnificent artwork and cater to your personal interests. During your visit, you will have a chance to see one of the world’s finest collections of sculptures, carvings, frescoes, and paintings. Your guide will focus your attention on the most important masterpieces, making this experience easy and unforgettable. Take the opportunity to learn about Roman and Greek mythology by admiring ancient statues of Pagan gods like Diana Efesina, in the Gallery of Candelabra. As you continue through the Gallery of Tapestries you will enjoy the elegance and precision of the Flemish artists. 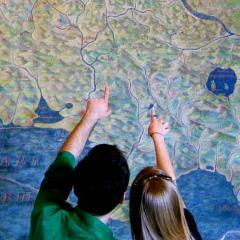 The, explore all of Italy at once in the fascinating Gallery of Maps. 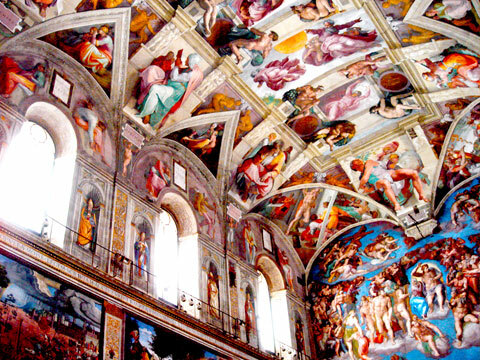 As the Grand Finale, be stunned by Michelangelo’s masterpiece fresco’s inside the Sistine Chapel. As speaking is forbidden once inside, learn before hand how to see the sistine chapel in all it’s cryptic resplendency, unlocking Michelangelo's private jokes and personal vendettas engulfed within The Last Judgement. Your tour will end in the St. Peter’s Basilica, one of the holiest shrines of Christianity. No wait-in-line guaranteed! Beat the early bird to the worm! With this extension you will have the opportunity to enter the Vatican Museums with no waiting time at all and secure your access 15 minutes ahead of the usual early bird opening, skipping any possible line. 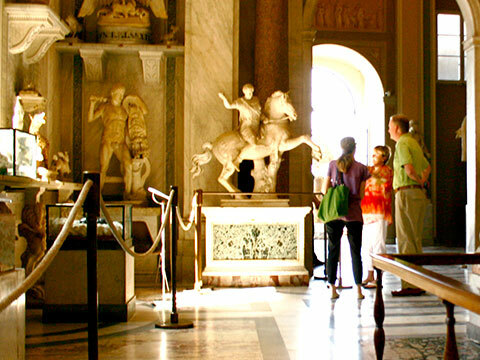 You will be able to enjoy the Museum Galleries as they come to life for the day, as well as enjoy a comfortable, relaxed, and seated Sistine Chapel explanation. This means that you will meet your guide at 7:30 at your accommodation or at 7:45 if you choose the meeting point near the site, as you will skip right through the entrance line (tour duration = 3 hours, as no time is spent in line). US$70** Please note: Price includes 1 extra hour with your guide and admission tickets will be charged separately - €10 for elevator (+320 steps), €8 for stairs only (551 steps). 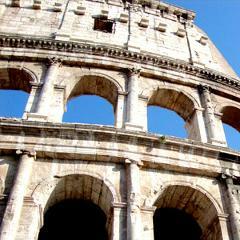 Climb the most famous Dome in the world designed by Michelangelo and learn its secrets! You can take 320 steps to reach the roof level or you can take the elevator. If you feel you have some energy left you can keep take more steps to reach the dome for an astonishing view of the eternal city. The Crypt of the Popes, also known as the Vatican Grottos, are positioned just below St. Peter's Basilica and above Constantine’s 4th century basilica. The grottos contain chapels dedicated to various saints and tombs of kings, queens and popes, dating from the 10th century. The holiest place is Peter’s chapel, located immediately above the spot were the Apostle’s tomb was venerated (not parte of the site). 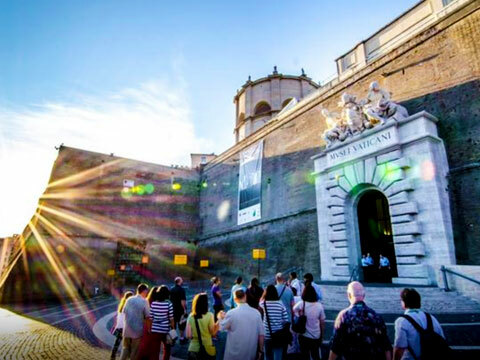 As you exit St. Peter’s Square, your guide will lead you along a quiet street that follows ‘Il Passetto’, the passageway connecting the Vatican to Castel Sant’ Angelo, the Pope’s fortress. You can opt to visit the castle for breathtaking views of the city or cross over Bernini’s famous bridge of angels for scenic views of the river. 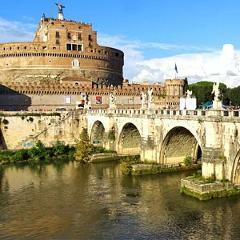 A beautiful addition to the Vatican Tour, Castel Sant' Angelo is a great bookend to your day. 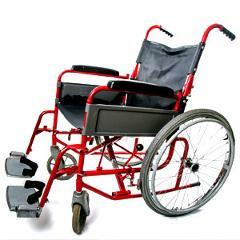 Add a wheelchair for your Vatican Museums visit. 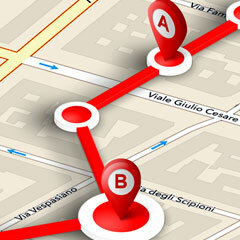 Your guide will select the best itinerary for you. 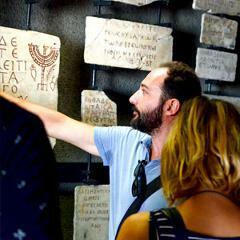 Transform your standard Vatican tour to a unique Jewish experience. Unlock the hidden symbols with a new perspective with your professional tour guide. Enrich your tour by visiting the Hebrew Lapidary containing ancient Jewish grave markers with inscriptions in Hebrew, Greek and Latin. The Lapidary was established in 1910 after it was discovered during the excavation of the Jewish catacomb of Monteverde in Rome. I would like to thank you all for the amazing tours! Mara and Daniel from the office were super fast and my guide Silvia Monti was amazing! We arrived late at the hotel and we waited till the very last minute, considering cancelling the evening walking tour as we were very tired. We are SO glad we did not. Silvia met us promptly at our hotel with a big smile on her face. 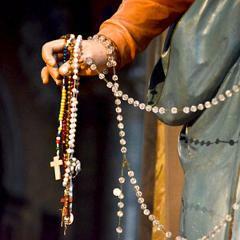 She welcomed us to Rome and we felt warmed up right away. She has such a sweet and smiley face. Rome is beautiful especially at night! 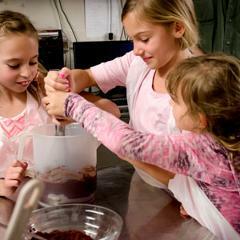 We got a lot of great insight on the what to see and do in the city. We had a late dinner at a great restaurant she recommended. I cannot remember the name but the food was awesome and cheap. All of the other guests seemed to be Italians- which was a very good sign. The day outside of Rome at Hadrian's Villa and Villa d'este was especially magical. After the two villas we had a nice promenande through the streets of Tivoli with nice panoramic views of the valley and a small villiage feel. Best coffee of our trip in an amazing little cafe here. 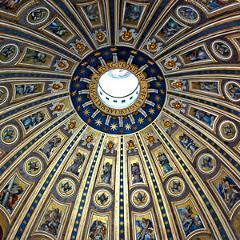 However, the gem of our trip though was the Early Bird Vatican tour. 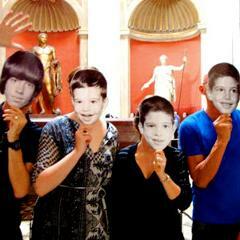 Thank you Eyes team for recommending this one- we didn't know you could enter the Vatican 1 hour before everyone else! Overall, the team at Eyes of Rome really came through for us, on short notice. Great booking experience, amazing history, and of course, our most lovely tour guide, Silvia Monti! She's the best!! If we happen to be running late for our tour (since we booked an early morning one) how can I get ahold of the guide? Will I see his/her contact details on the confirmation email? Hi Mark. Thank you for your interesting question. We always advise our guests to meet their guide at their hotel or accommodation to make sure you easily find each other. If you prefer to meet at the site instead this can be selected on your booking options (or you can send us an email separately) and your guide will be waiting for you at the meeting point. In this case when you make the booking remember to fill up your personal details with your telephone number so your guide will give you a call in case he/she does not see you at the meeting time. 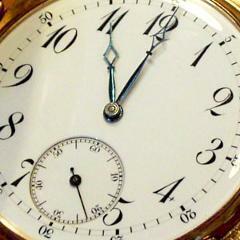 If it happens that you run late, please call our office (0039) 06 45503948 and we will put you in touch with the guide. We prefer to not hand out private information such as a guide personal phone number before our guides meet their guests. This is for privacy reason. For almost every tour there is not much of a difference for later starts, however, we advise everyone interested on an early bird to try their best to arrive on time at the meeting point otherwise the whole reason of having an early bird would be jeopardised. We remind you the an Early Bird experience makes sense because it does happen one hour before the Museums open to the general public. We hope this has been helpful, and we hope to see you soon in Rome. Regarding your questions, if the early bird is worth it, I would say is a big YES. First of all, with the Vatican early bird you avoid the biggest crowds. The tour starts at 7am or 7.30am and it finishes at 11.30am. At 9.30am the museums’ doors open to the general public and you will see the difference then. 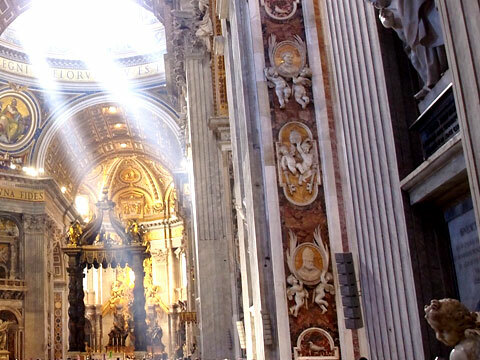 By that time we will be already half way through the tour, we will have visited already the Sistine Chapel, and will already be on our way to St. Peter’s basilica. Another fact to consider is that if you are planning to come to visit Rome in summertime, it is good to know that the museums get really warm due to the lack of air conditioning and to the number of visitors. Therefore the earlier the better! In terms of how many people visit the Vatican with an early booking, it is hard to answer to this question, since we are not the only tour operator offering this service. However the number of visitors on an early bird is roughly 20% of the visitors on a normal booking. The atmosphere, I can guarantee, is way different then on a normal Vatican entrance, more calm and relaxing, especially in the Sistine Chapel, and this is how it should be visited. I hope this answered your questions and concerns, and if you want to read more details about this tour I suggest you to have a look at this article. Please do not hesitate to contact us again if you have any other questions! 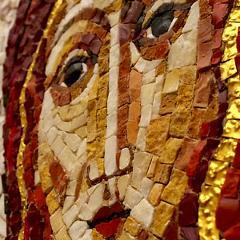 Hey Angela, I have done an early morning vatican with my partner in July and that made a huge difference on our day. The vatican got really packed at some point in the morning but we had already seen the most important places of the museums with few lucky ones (like us) inside. I really recommend this tour, especially during the high season. A big thanks also to the Eyes of Rome team and our guide Serena, lovely! Thank you eyes of rome for all the hard work you have done for us! We weren’t the easiest family I know :) Stefania, our guide for all of our stay in Roma was absolutely fantastic. 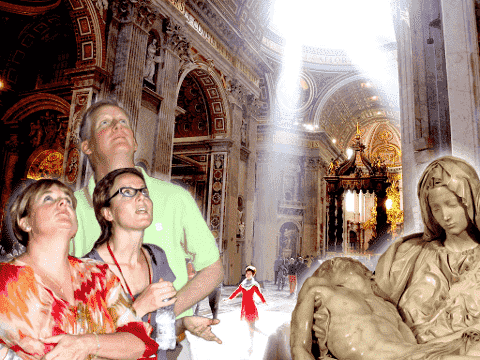 We booked the early vatican tour suggested by eyes of rome and it was just amazing. we did everything we could in three days, discovering, eating, walking…WE LOVE ROME! We went on a Early morning Vatican tour and Guiliano was our guide. Loved his enthusiasm and we were all impressed with his knowledge. Getting to see the Sistine Chapel before the crowds was the greatest thing! Afterwards, he gave us recommendations for food and coffee, and handed me his business card in case we had any questions while we were in town. We didn't get to the restaurant, but the coffee recommendation was spectacular! Tazza d'Oro! Wunderbare tour! Unsere guide Valeria war wirklich hervorragend. Es hat sich tatsächlich ausgelohnt die Tour um 7:30 zu beginnen, wir waren fast die ersten in den Museen! Just a quick note to say a big thank-you to our amazing Early Morning Tour Guide, Karin. We were so impressed with Karin's approachability and professionalism as well as her extensive knowledge of the art and museum exhibits. Karin was able to tailor the tour to best suit our interests, and we could not have hoped for a better experience. 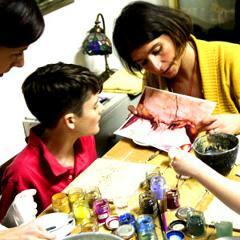 We will be recommending this tour, and Karin in particular, to all of our friends and family visiting Italy. Great questions about our PRIME upgrade! 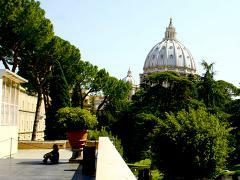 Our Vatican Early Morning tour is great, you can avoid much of the crowds by being some of the first people to enter the Museums by entering right when they open at 8AM. We are not the only tour company to have access to this entrance and to ensure we are some of the first people inside, we meet you at your hotel at 7 so that we can be some of the first (if not the first) in line to enter when doors open at 8AM. The PRIME upgrade gives you access to our exclusive (yes, we are the only PRIVATE tour company to have access to this) 7:45 entrance, without waiting in line at all! This means you can sleep a little extra, leave a little later, and still enter the Vatican before EVERYONE else!! This is my favorite product that we offer and I highly recommend it. Thanks for your question! Photos: Photos and Video are permitted with the exception of the Sistine Chapel. Personal ID: You do NOT need a passport to enter the Vatican. Personal Items: Large bags and large umbrellas are NOT allowed in the museum, retrieving checked items could effect your ability to cover the entire suggested itinerary.